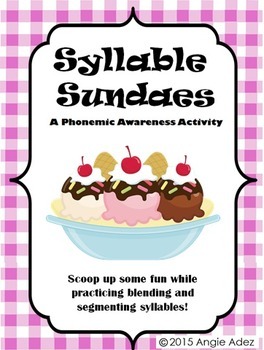 Scoop up some fun while practicing phonemic awareness skills! This is a fun way to introduce & reinforce blending and segmenting syllables. 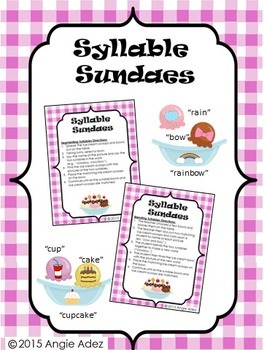 Introduce blending syllables by showing the students two ice cream scoop picture cards. The students name each picture and then select the bowl with a picture of the new word. This activity can also be used to practice segmenting syllables. The student chooses a bowl, says the name of the picture and segments the two syllables in the word (e.g., “cowboy, cow/boy”). He then finds the ice cream scoops with the pictures of the two syllables and places the matching ice cream scoops on the bowl. 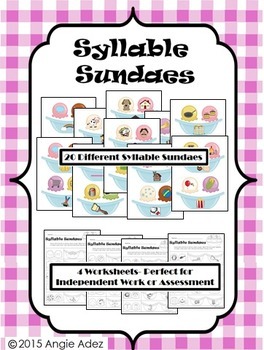 Includes four corresponding “Syllable Sundae” worksheets. These are perfect for independent work or assessment! 20 pages of FUN with words and sounds! This item is also available in a bundle- Fun with Phonemes!